The main reason people visit the Holy Land is because Jesus was born there. Jesus grew up in the fishing village of Nazareth (Matt. 2:23) in the home of Joseph, a carpenter, who taught Him to be a carpenter as well. Jesus, the eldest of five brothers and two sisters (Matt. 13:55), attended the synagogue regularly and also accompanied His family to the Temple in Jerusalem (Lk. 2:52). Because He had an above average understanding of the Scriptures and of God; most people thought that He had gone away to study at a special religious school - He was so knowledgeable about God's Kingdom (Lk. 2:46-52). But what people failed to understand is that Jesus had the Holy Spirit to guide and give Him the wisdom, knowledge and understanding. And what most people don't know, is that we too, upon receiving the Baptism of the Holy Spirit, can also have the "Counselor, the Holy Spirit, who will teach us all things, and bring to our remembrance all that Jesus has said to us" (Jn. 14:26). 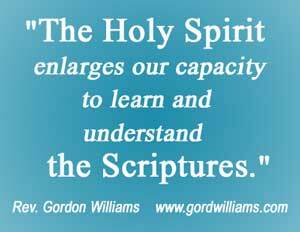 In other words, "the Holy Spirit enlarges our capacity to learn and understand the Scriptures". Those who have not received the authentic "Baptism of the Holy Spirit", demonstrate this with their lack of spiritual understanding. The bible tells us they are "unspiritual people" who "do not receive the gifts of the Spirit of God because they are spiritually discerned" (1 Cor. 2:14). Jesus told the scribes, "and you shall love the Lord our God with all of your heart and with all of your soul, and with all of your mind" (Mk. 12:30). Only those who have the Spirit of God (Holy Spirit) indwelling within them, can love with God's agape love (1 Cor. 13:4-8). Copyright © 2017. The Gordon Williams Evangelistic Association. All rights reserved.